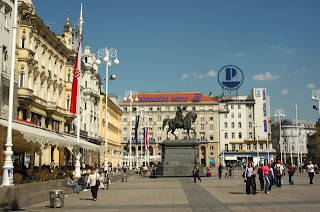 It is always a great joy for me to visit Zagreb. On the square pictured above I ministered the first time 1987….It was forbidden…but hundreds of people came to those meetings and many got saved and touched by God. This was during the Communist Era and today things are different. Tonight a “rockband” from the Church “Rijec Zivota” will minister on the same spot….with all necessary permit.. The church is growing in number and influence. We have had some wonderful meetings here and I must say that a part of my heart is definitely Croatian. i also spend much time with my brother Sicko, Senior pastor for this great work. He is very committed to see Croatia transformed and reached with with Gospel. He was with me translating on that square 1987, already than a man on fire and with a great compassion for his own people. He have seen much good fruit with churches planted allover Croatia. Spiritually Croatia is still in a great battle. Communism is gone forever I believe but now secularism and religion is very much in control. The official Church are working hard to remain and to gain control even over other Church denominations. There are initiatives today called “Assisi prayer meetings”. It sounds great…unity,love and understanding. The Catholic church arrange this and invites: Pentecostals ,Baptists ,Muslims,Buddhists and of course Catholics to pray together…to the same God. This is the official teaching from the catholic Church in Croatia. Everything is done under the umbrella of the Catholic Church. I get upset when I hear Church leaders(Charismatic Bible believing leaders) promoting events like that and expressing their excitement over the new steps of unity that is happening allover Europe. Is Mohammad,Buddha or even Mary a way to reach God? Nope….Jesus is the way. To say that in Europe today….is radical. So…lets be radical my friends!! Later this week I am going to Riga and minister in a church…5000+ strong..have not seen them for many years. Will be great to meet them again.